Steel cut oats are hearty and delicious, but they need a lot of time and attention. Cooking them in an electric pressure cooker results in creamy, perfectly cooked oats much more quickly without having to bother with them on the stovetop! Using a paper towel, grab some coconut oil and rub it around the inside of the pot of the pressure cooker, all the way to the top. Add the water, oats, and salt. Cook 12-14 minutes (use the manual setting; if you have the option of high or low, choose high. 12 minutes will have chewier oats, 14 minutes will be more creamy. If you live at a high altitude, add 1-2 minutes to your desired cook time.) When it’s done cooking, use the natural release (don’t manually release the pressure) for 10 minutes, then release the remaining pressure (if any) and open the pot. 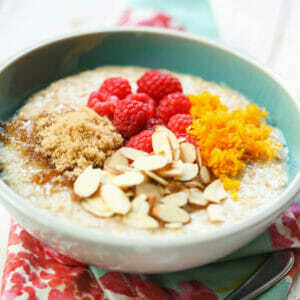 Stir the liquid into the oats until combined and serve immediately.